A beer with a spicy kick, with essence of citrus and fruit like tones, making for a strong well balanced, delectable aroma and flavour. A great Autumn and Winter beer. Greenock, Barossa Valley, South Australia. 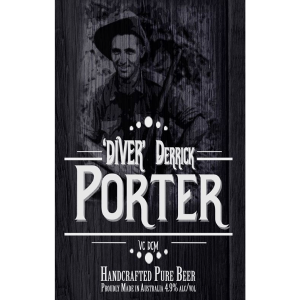 A full-bodied English Porter style ale. Generous amounts of drum roasted barley and chocolate malts are used, producing the chocolate and coffee characters that balance with mocha and smokey aromas that are not too dominant in the flavour. Nottingham ale yeast is used to retain the true English style, with Pride of Ringwood hops used for mild bitterness and subtle aromas. These hops can be described as having a spicy kick with essence of citrus and fruit like tones, making for a strong well balanced, delectable aroma and flavour.